and someone has opened the gate. This is a neat collapsing of assumptions when you come on the last clarifying realization after wondering about the possible causes of something strange you've just witnessed. The more complex scenarios involving agency are moot points entirely, inapplicable, uttered for their own sake. Someone simply forgot to close the gate and horses wandered off because that's what they do when their is no obstruction. Not with purpose, necessarily, but just wander off until they tire. That's what we all do, after all. "Freedom" is the slippery slope Richardson wisely skips.Being "free" is, to a degree, a matter of definition and how a culture collectively projects that onto the world it lives in; men are free (or not) , as far as the political and legal systems he finds himself under. Freedom is merely those things and activities that are not prohibited by the State. Horses, quite outside the concerns of human dignity, rights and wandering concepts like freedom, just are , as far we know, a species no less restricted than man is. Freedom , in any sense that's meaningful, requires a contrary concept and an attending philosophy--slavery, dictatorship, charismatic rule, indentured servitude, prison life. One chooses to live freely and one chooses, as well, an ethical system through which voluntary actions confirm the value of being relatively unhindered in one's pursuit of happiness. Man may well decide to wander to the river because he enjoys the water flowing by or because he prefers the taste of non-tapped water; these are aesthetic considerations, subjective, difficult to assess, perfect for a layering of justifying metaphor to explain the quaint preference. Horses, however, go to the river and wind up in flowerbeds because that's what they do; there is an imperative I'd say that has more to do with genetically generated behavior than with any dreamy concept of unfettered existence. Horses are free? To do what, be a horse? 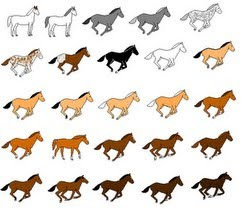 Horses haven't the means to become anything else other than horses and, for all we know, lack the facility to imagine themselves as another species. They are stuck being horses, with no choice in the matter.